Roasted Asparagus with Balsamic Brown Butter will BLOW YOUR MIND! – and it’s on your table in 15 minutes! 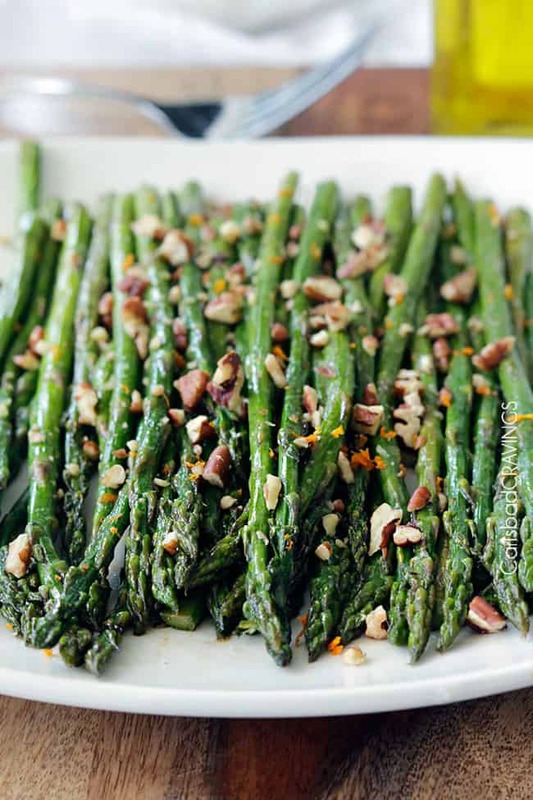 This Roasted Asparagus Recipe is hands down the BEST way to eat best way to eat asparagus! It’s a back pocket “ace” when you need a restaurant worthy side. The oven roasted asparagus is quick and easy, crisp tender perfection, made from pantry staples but tastes gourmet enough for any company or special occasions! I love asparagus. They are just so happy. Tall, and gangly but bursting with bright green “welcome spring” confidence. 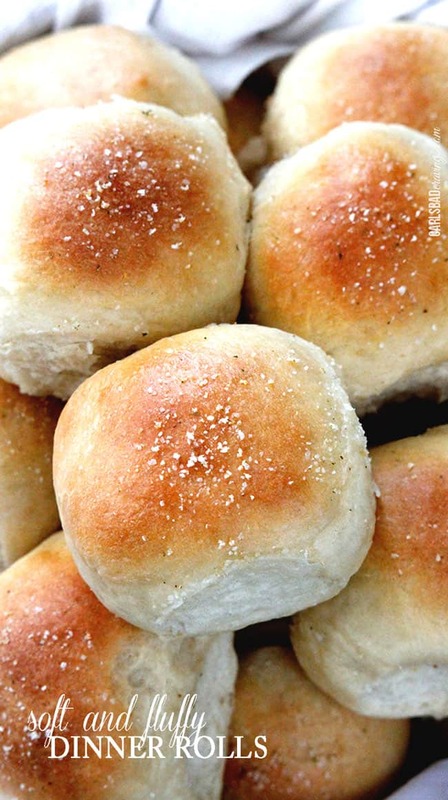 They are perfectly crisp and require nothing but roasting in a little olive oil, salt and pepper to taste delicious. But if you add some nutty, brown butter, tangy balsamic vinegar and soy sauce, you quite possibly have the best oven baked asparagus ever. 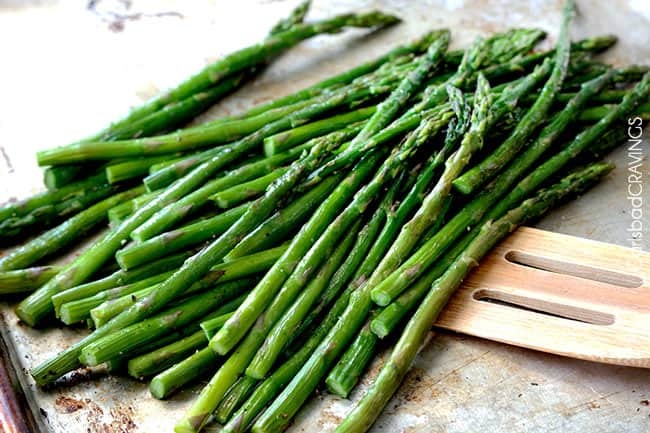 AND it doesn’t take any extra time than roasting regular asparagus because you make the 3 minute sauce while the asparagus is roasting with pantry staples you probably have on hand right now. When I first saw this baked asparagus recipe on Cooking Light, the reviews were really positive, but I still expected to change it a bit as I always try to make the best possible version I can of anything and everything. But to my surprise, I found this roasted asparagus perfect in its simplicity. First, start by snapping off the woody ends of the asparagus. The easiest way to do this is to hold the asparagus in one hand and bend it in the other near the base of the asparagus until it snaps. The asparagus will naturally snap where the unpalatable toughness ends begins leaving you with nothing but fresh asparagus. Next, we add our asparagus to a large baking sheet and drizzle with olive oil and toss until evenly coated. Next, arrange the asparagus in a single layer so it will roast and not steam. Season with freshly cracked salt and pepper. While our asparagus is roasting in the oven, we make our easy Balsamic Brown Butter. It might sounds exotic and intimidating but it’s super easy! Simply melt butter in a small skillet over medium heat. Once melted, cook approximately 3 minutes or until lightly browned, stirring constantly. It will bubble and foam, turn a dark golden hue and start to give off a nutty aroma. 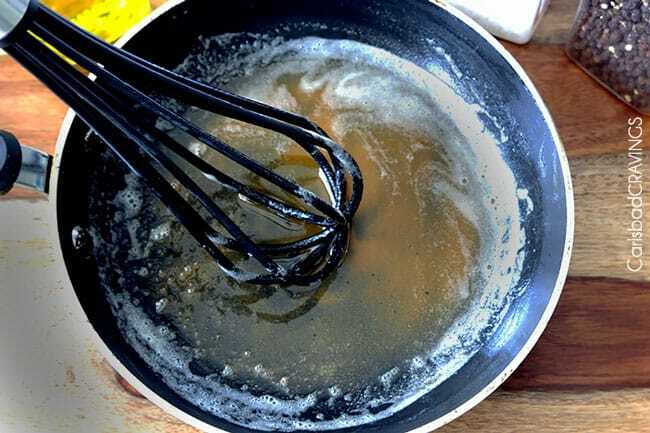 At this point, remove your pan from the heat immediately or the butter will burn if you continue to cook it. Next, off heat, stir in a splash of soy sauce and balsamic vinegar. Drizzle over your oven roasted asparagus, more or less to taste – you might not use all of all of the Balsamic Brown Butter. And eat! 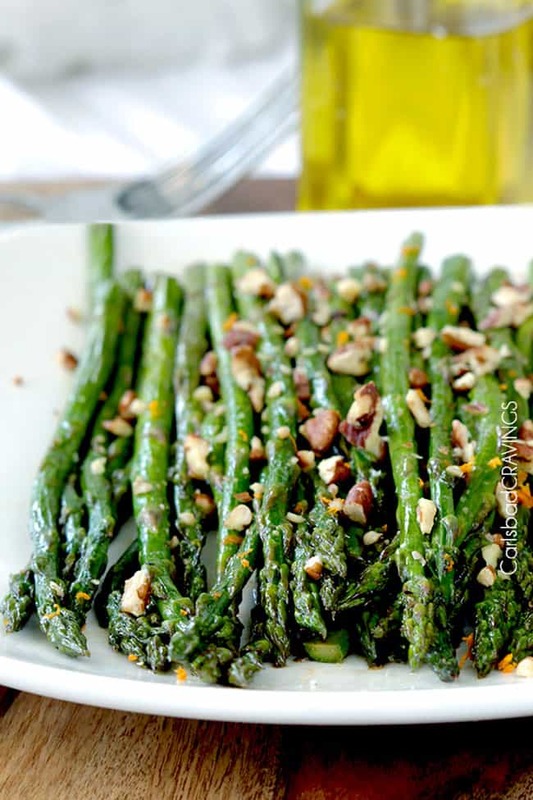 You really you won’t be able to stop eating this oven roasted Asparagus! I really do love it as much as candy – I was eating stalk after stalk with my fingers just like candy – for quality control purposes, of course. 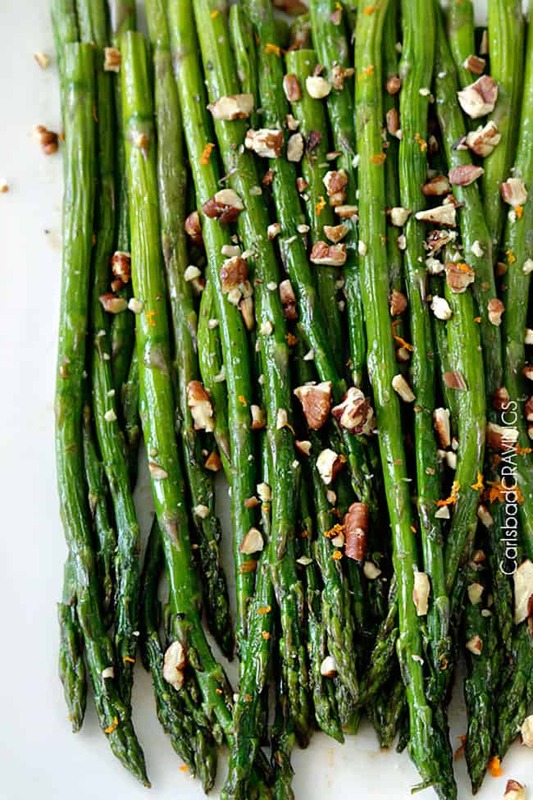 For extra special occasions, you can even top this roasted asparagus recipe with 5 Minute Perfect Caramelized Nuts (which I like to keep on hand for such occasions) and you you might as well triple the batch. 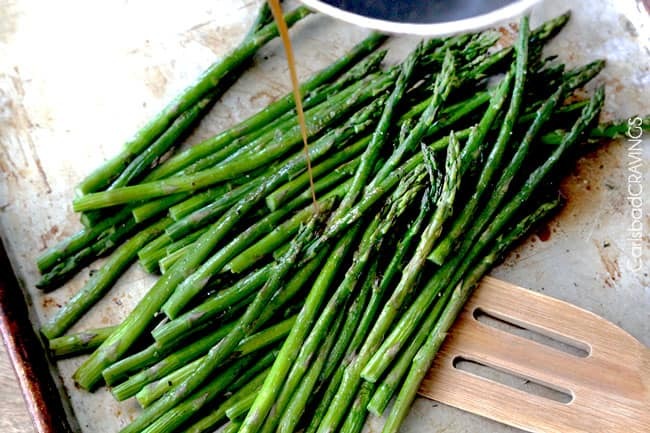 15 Minute Balsamic Brown Butter Roasted Asparagus. 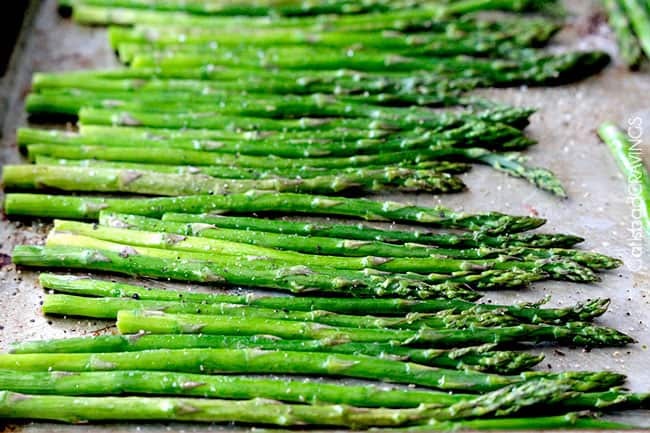 Turning your asparagus gourmet with pantry staples. It can be our secret. Roasted Asparagus with Balsamic Brown Butter will BLOW YOUR MIND! - and it's on your table in 15 minutes! This Roasted Asparagus Recipe is hands down the BEST way to eat best way to eat asparagus! It's a back pocket "ace" when you need a restaurant worthy side. 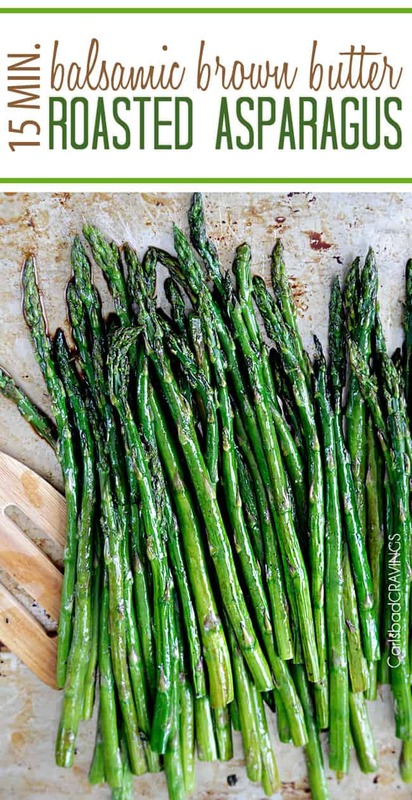 Add asparagus to a large baking sheet and lightly drizzle with olive oil. Toss to evenly coat and arrange asparagus in a single layer. Season with freshly cracked salt and pepper. Bake at 400F degrees for 8-10 minutes or until tender but still crisp. The last few minutes of cooking, melt butter in a small skillet over medium heat. Once melted, cook approximately 3 minutes or until lightly browned, stirring constantly. 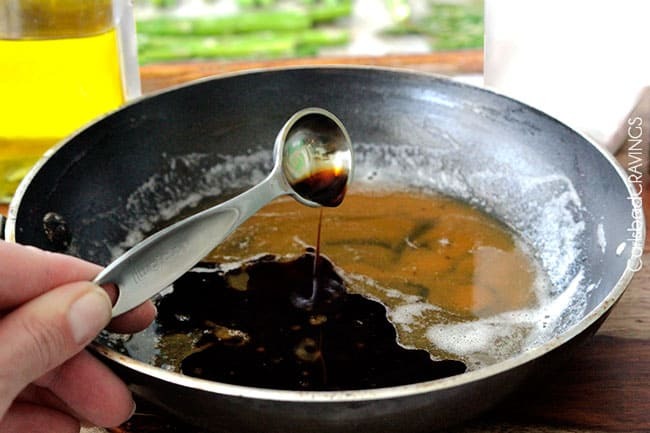 Remove from heat and stir in soy sauce and balsamic vinegar. Drizzle over asparagus to taste, tossing well to coat. You may not use all of the Balsamic Brown Butter. 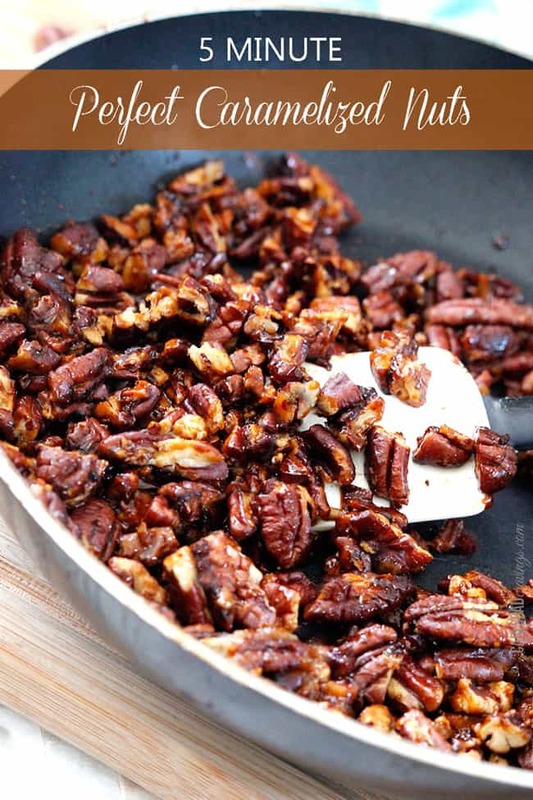 Garnish with orange zest (optional) and caramelized almonds, pecans or walnuts (optional). *Does not need to be exactly 50 asparagus because you can drizzle the Balsamic Brown Butter to taste. 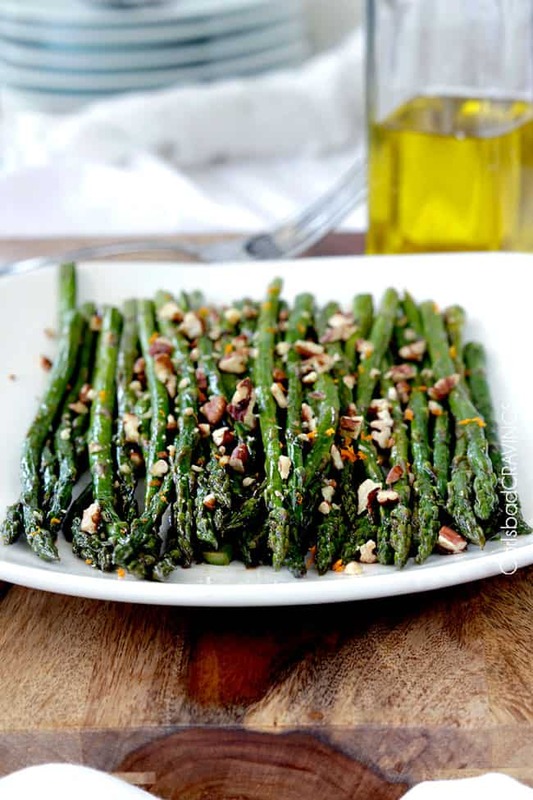 Want to try this Roasted Asparagus Recipe? 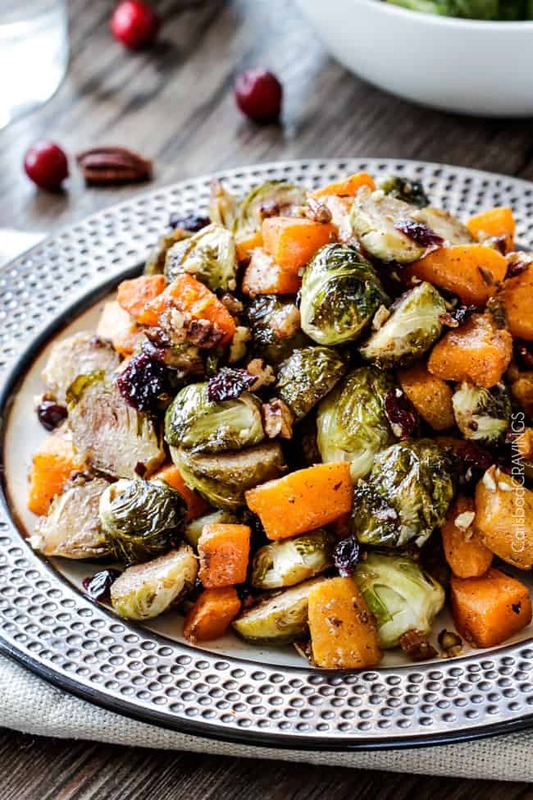 Pin it to your HEALTHY, SIDES or DINNER BOARD to SAVE for later! If I wanted to serve this to company but I’m taking it to the house, do I just take the browned butter there & warm it up and drizzle before serving ..or just do everything and bring it ready? Novice cook here. Trying to figure out if asparagus can travel and be served not immediately lol. This looks soo good with the nuts! I am so sorry I was on vacation and am just getting to your comment! 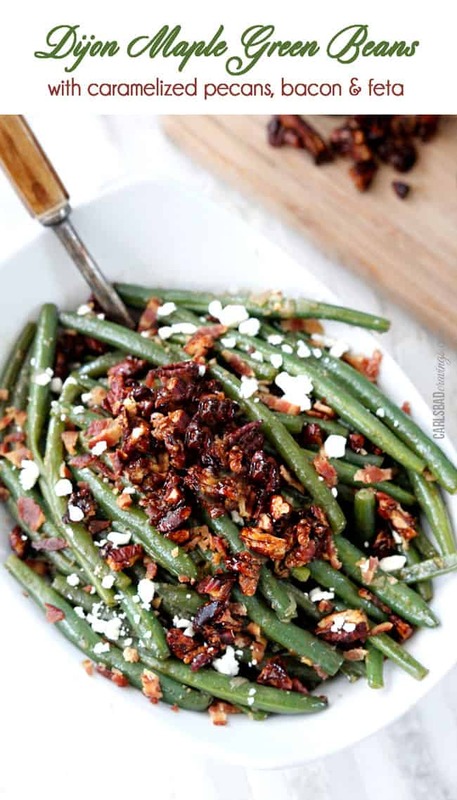 I am sure this comes to late but you could make this all in advance and toss with the balsamic butter but be sure to barely undercook the asparagus then you can warm in the microwave for just a minute or so to finish cooking and warm through. Hope this helps for next time!